Ubuntu Tweak is a cute little application meant to make the life of Ubuntu user a lot more easier. It has a number of small workarounds which are really useful especially if you are a newbie Ubuntu user. Some of Compiz animations like "Show Windows" is not at all easy-to-find, if you are not using Ubuntu Tweak. Recently Ubuntu Tweak 0.5.1 was released. 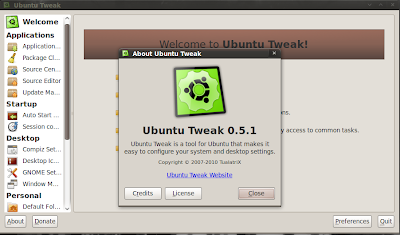 Here is what you need to do to install Ubuntu Tweak 0.5.1 in Ubuntu Karmic. Simply open Terminal and copy-paste the following line to Terminal. Again, Open Terminal and copy paste the following commands into Terminal. Thats it. Goto Applications > System Tools > Ubuntu Tweak.